Lymphadenectomy is the surgical removal of one or more groups of lymph nodes. It is almost always performed as part of the surgical management of cancer. In the treatment of head and neck cancer, three areas must be addressed: the primary site, the neck, and sites of distant metastasis. Of these, disease in the neck is the least straightforward. Even when there is no clinical or radiologic evidence of disease in the neck, 20-30% of patients may still harbor occult metastasis. In particular, cancers of the oral cavity, oropharynx, hypopharynx, and supraglottis are the most likely sites to have neck disease at presentation. Neck disease reduces survival rates for head and neck cancers by half. Therefore, control of the neck is of utmost importance in the successful management of these cancers. Complications and their prevention are described as follows. Factors negatively influencing the rate of recurrence include extracapsular spread (macroscopic extracapsular spread portends a worse prognosis than microscopic extracapsular spread), the number of lymph nodes involved, the number of lymph node levels involved, and perineural invasion. Adjuvant radiation therapy improves the rate of control in the neck. Sacrifice of the spinal accessory nerve results in denervation of the trapezius muscle (and sternocleidomastoid) as well as destabilization of the scapula. The patient experiences significant shoulder pain, weakness in abduction of the shoulder past 30 degrees­­, shoulder drop, and a winged scapula. Inadvertent injury to the spinal accessory nerve can occur in several situations. The spinal accessory nerve can sometimes lie superficial enough in the posterior triangle to be at risk during elevation of skin flaps. Dissection immediately along the anterior border of the trapezius muscle can injure branches of the spinal accessory nerve as they dive toward the deep surface of the muscle. Also, during excisional biopsies of the posterior triangle, the spinal accessory nerve can be found to run directly over the enlarged lymph node. During fine needle biopsy of the posterior triangle, the use of local anesthesia may eliminate spinal accessory nerve function so that the trapezius muscle does not contract upon penetration, and shoulder dysfunction can go unrecognized for hours until the anesthesia wears off. Pronounced postoperative swelling of the neck flaps may indicate a hematoma. If aggressive milking of the drains does not alleviate the problem immediately, then the patient should return to the operating room for a neck exploration, evacuation of the hematoma, and control of possible hemorrhage. Failure to recognize a hematoma may result in postoperative wound infection and poor wound healing. In order to avoid a chyle leak, it is important to avoid injury to the thoracic duct when dissecting inferomedially in the left neck. In addition, be sure to ligate any potential tributaries to the thoracic duct, and remember that the thoracic duct can be multiple in its course. Keeping a relatively bloodless field can be very helpful in accomplishing these goals. Also, before closing the wound, reinspect the wound bed for a possible leak. Increasing intrathoracic pressure for 20-30 seconds can aid in identifying possible leaks. Remember that chyle is not milky in fasting patients who have received nothing orally for 8-12 hours. Even if all precautions are taken, 1-2% of patients undergoing neck dissections will develop a chylous fistula. High-output fistulas (greater than 600 mL chyle per day) require return to the operative room for neck exploration, drainage of chyle, and control of the chyle leak. Low-output fistulas or those that become apparent only after the patient begins enteral feeding may be managed conservatively at first with drains, pressure dressings, and a low-fat diet. If this fails to alleviate the problem, then parenteral nutrition can be considered prior to returning to the operating room. If both internal jugular veins are sacrificed, the patient is at risk for facial and/or cerebral edema. Facial edema may resolve over time as collateral circulation develops. It is more common and more severe in patients who have a history of radiation therapy and in those who undergo pharyngectomies. It can be prevented by preserving at least one external jugular vein. Patients in whom bilateral radical neck dissections are performed are at risk for cerebral edema and subsequent neurologic dysfunction. Increased intracranial pressure resulting from bilateral internal jugular vein sacrifice may cause a syndrome of inappropriate antidiuretic hormone secretion and subsequent extracellular fluid expansion and hyponatremia, worsening the neurologic effects. Thus, perioperative fluid management in these patients must be cautious and cannot depend on urine output as a sole indicator, but must take into consideration central venous pressure, cardiac output, and serum and urine osmolarity. Blindness is a rare but catastrophic event after bilateral neck dissection, with only five cases reported in the literature. It is presumed to be a result of intraoperative hypotension in addition to insufficient venous drainage. Incisions should not expose the carotid artery directly, and any trifurcations should be well away from this region. Fistula formation and flap breakdown are more common in the setting of previous radiation, poor nutrition, diabetes, and wound infection. Fistulas tracking over the carotid artery are at high risk of carotid artery rupture. To prevent this complication in patients with risk factors, careful closure of mucosal defects is of utmost importance. The use of free and pedicled vascularized flaps provides skin for closure of these defects and has greatly reduced the incidence of this potentially lethal complication. Should a pharyngocutaneous fistula form, large defects with high-output fistulas, especially in previously irradiated patients, are unlikely to heal. The patient should be taken to the operating room for a repair of the fistula and coverage of the carotid artery with a vascularized flap. If a carotid artery rupture occurs, immediately apply manual pressure. Administer fluids and blood products to maintain hemodynamic stability. Carotid artery stenting can provide a temporizing measure prior to ligation of the artery. Prior to this, a balloon occlusion test may provide key information as to whether the patient would be able to tolerate a complete ligation. Repair of the ruptured segment is generally futile. Therefore, the definitive management requires ligation of the carotid artery ligation both proximal and distal to the site of rupture. The greater auricular nerve provides sensation to the auricle. This nerve can often be preserved in selected neck dissections, but sacrifice is well tolerated and is routinely sacrificed by many surgeons. The cervical branch of the facial nerve is commonly sacrificed during neck dissections with minimal sequelae. When the skin flaps are being elevated, the mandibular branch of the facial nerve is commonly encountered, and every attempt is made to preserve it. Injury to this nerve will cause weakness of angular depression of the lips along with obvious lower lip and commissural asymmetry. The hypoglossal nerve exits near the jugular foramen, passes deep to the internal jugular vein, then superficial to the internal and external carotid arteries as it gives off a branch to the ansa cervicalis that lies on the carotid sheath. It then travels across the floor of the submandibular triangle parallel to the submandibular duct and passes deep to the posterior belly of the digastric muscle before entering into the tongue musculature. This nerve can be injured during indiscriminate clamping of the venous plexus posterior and inferior to the posterior belly of the digastric muscle or during dissection of the floor of the submandibular triangle. Occasionally, it can be adherent to the submandibular duct due to reactive fibrosis. 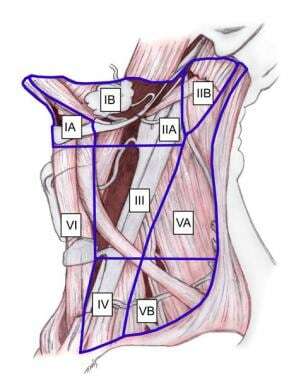 The brachial plexus is at risk during dissection of the posterior triangle (level V). It can be found exiting between the anterior and middle scalene muscles, deep to the posterior belly of the omohyoid muscle and transverse cervical artery. Injury can cause a combination of upper extremity numbness and weakness. The phrenic nerve is also at risk during dissection of the posterior triangle (level V). It runs across the superficial surface of the anterior scalene muscle just anterior to the brachial plexus and underneath the transverse cervical artery. This nerve can be inadvertently injured during removal of the cervical plexus in radial and modified neck dissections when the dissection is carried too deep in the plane above the scalene muscles. Be sure to keep the plane of the dissection above the fascia of the scalene muscles, dividing the cervical nerves only after they exit the plexus and enter the specimen. Injury to the phrenic nerve will cause hypoventilation of the affected lung, leading to pulmonary compromise, atelectasis, and a high risk for pulmonary infection. The sympathetic chain is located in the prevertebral fascia posterior and deep to the carotid sheath. Avoid dissecting deep to the carotid artery as injury to the sympathetic chain may result in Horner syndrome (ptosis, miosis, and anhidrosis). Relevant anatomy and clinical significance are presented in the table below. There is a risk of malignancy from the floor of mouth, anterior oral tongue, anterior mandibular alveolar ridge, and lower lip. To ensure excision of all lymph nodes, the submandibular gland is excised in conjunction with this dissection. There is a risk of malignancy from oral cavity, anterior nasal cavity, and soft tissues of midface. There is a risk of malignancy from the oral cavity, nasal cavity, nasopharynx, oropharynx, hypopharynx, larynx, and parotid gland. Dissection of this group involves significant risk for shoulder dysfunction. In the absence of nodal disease in level IIa, it is not necessary to include level IIb for cancers of the oral cavity or larynx. There is a risk of malignancy from the oral cavity, nasopharynx, hypopharynx, and larynx. There is a risk of malignancy from the hypopharynx, thyroid, esophagus, and larynx. There is a risk for malignancy from the nasopharynx, oropharynx, posterior scalp, and neck skin. There is a risk for malignancy from the thyroid, larynx, piriform sinus, and esophagus. See Cervical Spine Anatomy and Lymphatic System Anatomy for more information. 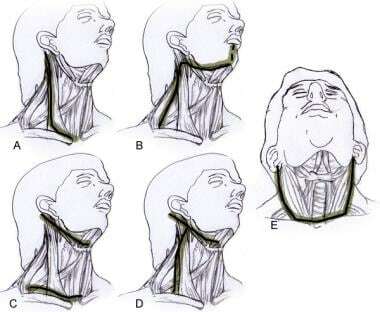 levels of the neck are shown in the image below. General anesthesia with an endotracheal tube is required. Paralytic drugs should be avoided because their use prevents the ability to stimulate key motor nerves for monitoring during the dissection (eg, mandibular branch of the facial nerve, spinal accessory nerve, phrenic nerve). If a tracheostomy is planned, perform this procedure first and ventilate the patient through an armored endotracheal tube secured to the chest with sutures. Use a supine position with shoulder roll to extend the neck. Place the patient in reverse Trendelenburg. The patient is prepped to expose the mentum, earlobes and mastoid, clavicles, and sternum. Stapling the drapes is helpful to preserve the sterile field throughout the surgery. 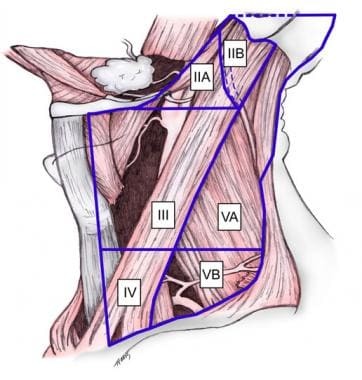 Radical neck dissection involves the removal of lymph node levels I to V, the spinal accessory nerve, the internal jugular vein, and the sternocleidomastoid. Radical neck dissection is indicated for extensive lymph node metastasis with extracapsular extension involving the spinal accessory nodes and internal jugular vein. Incisions are shown in the image below. Incisions for radical and modified radical neck dissections. A, Hockey stick. B, Boomerang. C, McFee. D, Modified Schobinger. E, Apron or bilateral hockey stick. The hockey stick incision is the standard incision that allows exposure of levels I though IV, but the boomerang and McFee incisions also allow appropriate exposure while avoiding trifurcations (especially over the carotid). The boomerang incision is less aesthetically pleasing, but it can be extended through the mentum and lip for oral cavity tumors requiring a mandibulotomy. Avoid trifurcations, especially overlying the carotid. Initial incision is carried through the platysma muscle which is deficient in the midline and also further out laterally. The flap is raised in the subplatysmal layer, leaving the external jugular vein and greater auricular nerve down on the sternocleidomastoid. The flaps are carried superiorly to the lower border of the mandible and inferiorly to the clavicle. Care is taken not to injure the spinal accessory nerve superficially in the fibrofatty tissue of the posterior triangle. The marginal mandibular branch of the facial nerve lies along the body of the mandible (80%) or within 2 cm of the inferior border of the mandible (20%). To protect this nerve, it can either be visually identified or the anterior facial vein can be ligated at the anterior border of the sternocleidomastoid and elevated superiorly with the submandibular fascia. Although the order in which the neck levels are dissected is a matter of individual preference, theoretically it is more oncologically sound to dissect from posterior to anterior and inferior to superior given the natural course of metastatic disease in head and neck cancer. Expose the anterior border of the trapezius from its superior aspect where it converges with the sternocleidomastoid down to its inferior attachments to the clavicle. From superior to inferior, incise the fibrofatty tissue at the anterior border of the trapezius to expose the muscular floor of the posterior triangle. The spinal accessory nerve will be encountered and severed as it enters the trapezius muscle on the inferior aspect of the posterior triangle. From posterior to anterior, incise the fibrofatty tissue at the superior border of the clavicle to further expose the floor of the posterior triangle. The posterior belly of the omohyoid muscle will be encountered and severed. This muscle lies superficial to the brachial plexus, phrenic nerve, and transverse cervical artery and vein. Identification of this muscle aids in preservation of these structures. The transverse cervical artery will be encountered overlying the floor of the posterior triangle. This artery should be preserved if it is not involved. Being careful to remain superficial to the prevertebral fascia, the contents of the posterior triangle should be elevated from posterior-lateral to anterior-medial. Remaining superficial to the prevertebral fascia prevents injury to the phrenic nerve and brachial plexus. The sensory branches of the cervical plexus will be encountered and transected. Continue to elevate the fibrofatty tissue anteromedially toward the carotid sheath, incising through the mastoid and clavicular attachments of the sternocleidomastoid. Once the carotid sheath is exposed, identify the common carotid artery, vagus nerve, and internal jugular vein. In addition, the sympathetic chain will be within the prevertebral fascia posterior and deep to the carotid sheath; this structure should be preserved. Dissect between the common carotid artery and vagus nerve below and the internal jugular vein above, mobilizing the internal jugular vein from the skull base to the clavicle and ligating it at its ends. At the inferomedial aspect of the dissection, be cognizant of lymphatic channels that may result in a chyle leak, especially in the left neck. The thoracic duct is located medial to and behind the left common carotid artery, and it travels upward, forward, and laterally, anterior to the thyrocervical trunk, transverse cervical artery, and phrenic nerve, passing between the internal jugular vein and anterior scalene to empty into the junction of the internal jugular vein and subclavian vein. The anatomy of the thoracic duct varies considerably; there may be multiple channels in the neck. To avoid a chyle leak, en bloc ligation of the lymphatic pedicle is preferred after the carotid artery, vagus nerve, internal jugular vein, and phrenic nerve have been positively identified. Injury of the thoracic duct necessitates immediate repair with identification and ligation of the duct. Fibrin glue has also been found to be useful. Once the neck contents are released inferiorly, retract the specimen superiorly and dissect along the carotid artery as far medial as the sternohyoid muscle. The carotid bifurcation will be exposed. The superior thyroid artery and superior laryngeal nerve should be preserved. As tributaries of the internal jugular vein are exposed (middle and superior thyroid veins, retromandibular vein), they should be ligated. Identify the hypoglossal nerve that runs from medially from superior to inferior over the external carotid artery. Identify the posterior belly of the digastric muscle and divide the neck contents superior to this muscle, including the sternocleidomastoid at its mastoid attachment and soft tissue attachments to the angle of the mandible. Divide the soft tissue overlying the mandible, including the facial artery and vein as they emerge over the border of the mandible. The ipsilateral and contralateral anterior bellies of the digastric muscles are skeletonized. 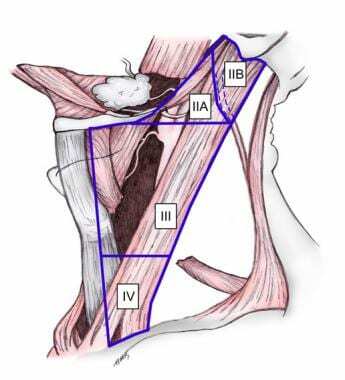 Dissecting from anterior to posterior, the fibrofatty contents of the submental triangle are removed, eventually dissecting the contents off the mylohyoid muscle in the anterior portion of the submandibular triangle until the lateral border of the mylohyoid muscle is identified. Retract the lateral border of the mylohyoid muscle anteriorly to expose the deep contents of the submandibular triangle, exposing the lingual nerve, submandibular ganglion, submandibular duct, and hypoglossal nerve. Isolate and ligate the submandibular duct. Divide the submandibular ganglion, allowing the lingual nerve to retract superiorly away. Irrigate the wound with distilled water. 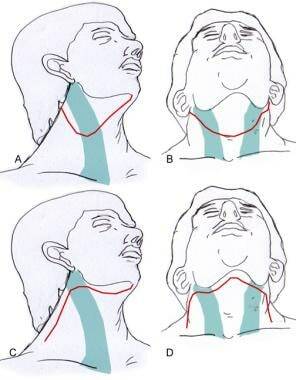 Place neck drains in dependent areas of the dead space and bring them out through separate stab incisions. Place drains to low continuous suction. Reapproximate the platysma and close the subcutaneous tissue in one layer, and close the skin in a second layer. 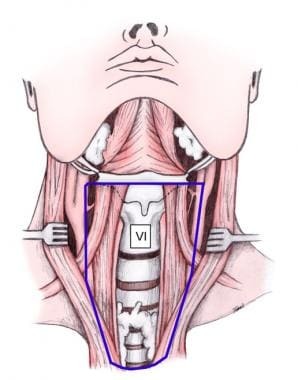 Modified radical neck dissection involves removal of lymph node levels I to V with preservation of at least one of the nonlymphatic structures (spinal accessory nerve, internal jugular vein, or sternocleidomastoid). Preservation of the spinal accessory nerve protects against the morbidity of shoulder dysfunction while preservation of the internal jugular vein relates mainly to the complications encountered in bilateral sacrifice of the veins, mainly facial swelling and increased intracranial pressures. Modified radical neck dissection is indicated for lymph node disease that does not directly infiltrate and is not fixed to nonlymphatic structures. During the dissection, one or more of the nonlymphatic structures may require sacrifice if they are grossly involved by the cancer. Modifications for the procedure compared to radical neck dissection are explained in the following sections. As it exits the jugular foramen, the spinal accessory nerve runs deep to the posterior belly of the digastric and stylohyoid muscles and lateral to the internal jugular vein. In up to 30% of cases, it can be found to pass under the internal jugular vein, or in very rare cases, the internal jugular vein splits around the spinal accessory nerve. It then tracks posteriorly and inferiorly gives off a branch that innervates the sternocleidomastoid from its deep surface near the junction of its superior and middle thirds. The remaining portion of the spinal accessory nerve exits the sternocleidomastoid near Erb’s point, where the four superficial branches of the cervical plexus, including the greater auricular nerve, emerge behind the muscle at the junction of the upper and middle thirds of the muscle. It then passes superficially through the posterior triangle to enter the anterior border of the trapezius near the middle and inferior thirds of this muscle. While elevating the skin flaps, be careful not to injure the spinal accessory nerve as it runs superficially in the fibrofatty tissue of the posterior triangle. Find the nerve as it exits the posterior border of the sternocleidomastoid near Erb’s point. Use of a nerve stimulator may be helpful. Any tissue overlying the spinal accessory nerve should be divided so that it may later be passed under the spinal accessory nerve. Dissect the spinal accessory nerve away from the underlying neck contents to the point at which it enters the anterior border of the trapezius muscle. Incise the anterior border of the sternocleidomastoid from its mastoid attachment to its sternal attachments and retract it laterally along its course. As the upper portion of the sternocleidomastoid is retracted laterally, the superior segment of the spinal accessory nerve is seen to enter the deep surface of the sternocleidomastoid. Free the posterior border of the sternocleidomastoid from its mastoid attachment to its clavicular attachment. Trace the spinal accessory nerve superiorly until it reaches the posterior belly of the digastric muscle. Retract the muscle superiorly to expose the superior end of the internal jugular vein as it exits the jugular foramen. This allows mobilization of the spinal accessory nerve from its exit from the skull base to its entry into the anterior border of the trapezius muscle. As the fibrofatty contents are dissected forward over the carotid artery, vagus nerve, and internal jugular vein, retract the sternocleidomastoid laterally to pass the contents underneath the muscle for continued dissection into the anterior cervical triangle. Once the carotid sheath is exposed, carefully dissect the neck contents off the sheath up to the border of the sternohyoid muscle, leaving the internal jugular vein intact if it is not involved with the gross disease. Selective neck dissection consists of en bloc removal of lymph node groups that are at risk for harboring metastatic disease, while preserving at least one lymph node group. The levels removed depend on the primary disease site and its known pattern of spread. About 20-30% of patients without clinical evidence of nodal disease are found to have pathologic evidence of malignancy. In the case of clinically negative (N0) necks, elective management of the neck via cervical lymphadenectomy provides verification of the true status of the neck to guide therapy. Elective surgical management of the N0 neck is further supported by the observation that results for salvage surgery for necks that subsequently develop neck disease are poor. Selective neck dissections were popularized by surgeons at MD Anderson in the 1980s who removed only the lymph node groups at highest risk in patients with N0 disease. Their studies showed that selective neck dissection provided the same oncologic benefit to patients as the more extensive neck dissections while sparing patients the functional and cosmetic deficits. The recurrence rate in the necks of these patients was found to be comparable to the group who had radical neck dissections performed. A selective neck dissection is generally performed when the risk of occult disease is greater than 15-25%, such as cancers of the oral cavity, oropharynx, supraglottis, and hypopharynx. In patients who have recurrent disease after therapeutic doses of radiation or chemoradiation therapy, recent studies also support the use of selective neck dissection in a salvage neck dissection. Lymphatic drainage patterns have been confirmed by both anatomic studies and clinical studies to be relatively constant and predictable. If positive nodes are found in the primary basins, it is possible that the tumor has also metastasized beyond these first echelon nodes. [8, 9, 10] The predicted spread of lymph node metastasis is described in the respective discussions on selective neck dissections for regional head and neck cancers. Carcinoma of the oral cavity (floor of mouth, anterior tongue, and buccal mucosa) frequently involves the lymph nodes of the submandibular triangle, the jugulodigastric nodes, and midjugular nodes (levels I, II, and III). Tumors of the floor of mouth and oral tongue tend to metastasize early, regardless of the size or grade of the primary tumor. Oral cavity tumors frequently metastasize bilaterally. They are also known to occasionally skip the submandibular and jugulodigastric nodes and metastasize initially to the midjugular nodes (level III). In cancers of the buccal mucosa, upper gum, and upper lip, the perifacial lymph nodes lying lateral to the mandibular body are also at risk. Dissection of this lymph node group places the mandibular branch of the facial nerve at increased risk. A selective neck dissection for an oral cavity cancer is also referred to as a supraomohyoid neck dissection (see image below). Contralateral selective neck dissection (levels I-III) is indicated for tumors of the floor of mouth and ventral or midline tongue, as well as for ipsilateral palpable neck disease. Modifications for the procedure compared to selective neck dissection are explained in the following sections. Incisions for selective neck dissection (I to III). A, Modified apron incision. B, Apron incision. C, Boomerang incision. D, Bilateral boomerang incision. For a unilateral neck dissection, a modified apron incision is adequate to dissect levels I-III. For a bilateral neck dissection, the apron incision is reflected horizontally across the midline. For oral cavity lesions in which it is necessary to dissect additional lymph node levels, a boomerang incision is preferred. For N2c disease, a bilateral boomerang incision is preferable because it can easily be extended to expose additional levels of the neck. When it is necessary to split the lip for access to the primary tumor with a unilateral neck dissection, the medial component of the unilateral apron incision can be extended. When it is necessary to split the lip with a bilateral neck dissection, it is better to switch to a bilateral boomerang incision with extension of a limb upward from midline to split the lip. Carcinoma of the oropharynx, hypopharynx, and larynx frequently involve the jugulodigastric, midjugular, and lower jugular nodes (levels II, III, and IV). The lateral retropharyngeal lymph nodes are at risk in pharyngeal tumors, including cancers of the base of tongue, tonsil, soft palate, and uvula, which extend onto the lateral pharyngeal wall. Cancer of the oropharynx places the level IIB lymph nodes at risk more so than those of the hypopharynx or larynx. There is controversy regarding whether cancers of the oropharynx involve lymph node levels II through IV or I through III. A selective neck dissection involving these nodes is also referred to as a lateral neck dissection (see image below). Skin cancer of the posterior scalp and upper neck predominantly metastasize to the suboccipital, retroauricular, jugulodigastric (level II), midjugular (level III), lower jugular (level IV), and posterior triangle (level V) lymph nodes. A neck dissection to remove the lymphatic tissue in these areas is referred to as a posterolateral neck dissection. Skin cancer of the anterior scalp, temporal region, and preauricular skin spreads to the parotid and facial nodes, the jugulodigastric (level II), midjugular (level III), upper posterior triangle (level VA), and external jugular nodes. Skin cancer of the anterior and lateral face drains to the parotid and facial nodes, the submental/submandibular (level I), jugulodigastric (level II), and midjugular (level III) nodes. This section describes the selective neck dissection for skin cancers of the posterior scalp and upper neck. Skin cancers in other portions of the scalp and face necessitate a parotidectomy along with a neck dissection to remove primary lymph node basins (see image below). Neck dissection for scalp/cutaneous malignancies. The patient should be in the lateral decubitis position to properly expose the posterior scalp and occiput, unless the primary lesion is midline, in which case the patient should be prone to facilitate bilateral neck dissections. Either a lazy S incision or a hockey stick incision with an extension at its superior end horizontally along the nuchal ridge is adequate for exposure of the upper, middle, and lower jugular nodes, the posterior triangle, and the nuchal ridge to the occiput. Posteriorly, the flap is raised in the subdermal plane up to the nuchal line. Incise the soft tissue overlying the nuchal ridge and occiput. Dissect down to the upper neck muscles and carry this dissection inferiorly to remove the retroauricular and suboccipital lymph nodes. Divide the upper part of the trapezius muscle near the occipital attachments to expose the suboccipital nodes following along the occipital artery. Central compartment dissection involves the paratracheal, precricoid (Delphian), and perithyroidal nodes, as well as nodes along the recurrent laryngeal nerve. Dissection of this area is also called an anterior neck dissection (see image below). If lymph nodes have metastasized below the suprasternal notch, dissection of the superior mediastinal lymph nodes (level VII) is indicated. If the lateral or posterior triangle compartments are to be dissected, perform this dissection first. The strap muscles may either be divided near their sternal attachments or retracted laterally to expose the level VI contents. Skeletonize the carotid artery along its medial border from the clavicle to the superior thyroid artery. Mobilize the lateral border of the thyroid gland by dissecting the fascia and dividing its arterial and venous blood supply. Identify the RLN as it runs from inferior to superior in the tracheoesophageal groove, coursing into the Killian-Jameson triangle. This nerve should be preserved unless a laryngectomy is planned. Identify the parathyroid glands and reimplant them into the sternocleidomastoid. Remove the fibrofatty contents from the carotid artery laterally to the contralateral carotid artery. The neck contents are dissected as far superiorly as the hyoid bone and as far inferiorly as the sternal notch. With this technique, a tracer material is injected at the primary site and detected within the lymph nodes after an appropriate period of time. Unfortunately, in the head and neck, studies have shown that primary basins can often be multiple; a single site can drain to more than one lymph node group. Each of these lymph nodes needs to be dissected, sectioned, and examined histologically for evidence of tumor spread. Revascularization can be performed as long as proximal and distal ends of the CCA and ICA are preserved. Common graft materials include both the saphenous vein graft and prosthetic grafts. Patients with head and neck cancer are generally within the age group in which vascular disease is common. Atherosclerotic disease can place a patient at risk for embolic stroke with carotid artery manipulation during surgery. Gentle handling and minimal manipulation of the carotid artery can avoid this complication. Patients with any symptoms of embolic events should be considered for preoperative carotid artery stenting or simultaneous carotid endarterectomy. Schoppy DW, Rhoads KF, Ma Y, Chen MM, Nussenbaum B, Orosco RK, et al. Measuring Institutional Quality in Head and Neck Surgery Using Hospital-Level Data: Negative Margin Rates and Neck Dissection Yield. JAMA Otolaryngol Head Neck Surg. 2017 Nov 1. 143 (11):1111-1116. [Medline]. Lippert D, Dang P, Cannon D, Harari PM, McCulloch TM, Hoffman MR, et al. Lymph Node Yield in Therapeutic Neck Dissection: Impact of Dissection Levels and Prior Radiotherapy. Ann Otol Rhinol Laryngol. 2017 Nov. 126 (11):762-767. [Medline]. Graboyes EM, Garrett-Mayer E, Ellis MA, Sharma AK, Wahlquist AE, Lentsch EJ, et al. Effect of time to initiation of postoperative radiation therapy on survival in surgically managed head and neck cancer. Cancer. 2017 Dec 15. 123 (24):4841-4850. [Medline]. Short SO, Kaplan JN, Laramore GE, Cummings CW. Shoulder pain and function after neck dissection with or without preservation of the spinal accessory nerve. Am J Surg. 1984 Oct. 148(4):478-82. [Medline]. Byers RM. Modified neck dissection. A study of 967 cases from 1970 to 1980. Am J Surg. 1985 Oct. 150(4):414-21. [Medline]. Byers RM, Clayman GL, McGill D, Andrews T, Kare RP, Roberts DB. Selective neck dissections for squamous carcinoma of the upper aerodigestive tract: patterns of regional failure. Head Neck. 1999 Sep. 21(6):499-505. [Medline]. Robbins KT, Medina JE, Wolfe GT, Levine PA, Sessions RB, Pruet CW. Standardizing neck dissection terminology. Official report of the Academy's Committee for Head and Neck Surgery and Oncology. Arch Otolaryngol Head Neck Surg. 1991 Jun. 117(6):601-5. [Medline]. Skolnik EM, Yee KF, Friedman M, Golden TA. 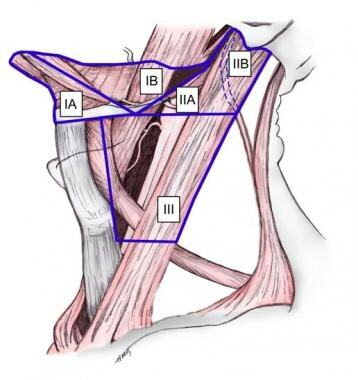 The posterior triangle in radical neck surgery. Arch Otolaryngol. 1976 Jan. 102(1):1-4. [Medline]. Byers RM, Weber RS, Andrews T, McGill D, Kare R, Wolf P. Frequency and therapeutic implications of "skip metastases" in the neck from squamous carcinoma of the oral tongue. Head Neck. 1997 Jan. 19(1):14-9. [Medline]. Kontio R, Leivo I, Leppänen E, Atula T. Sentinel lymph node biopsy in oral cavity squamous cell carcinoma without clinically evident metastasis. Head Neck. 2004 Jan. 26(1):16-21. [Medline]. Pitman KT, Johnson JT, Edington H, Barnes EL, Day R, Wagner RL. Lymphatic mapping with isosulfan blue dye in squamous cell carcinoma of the head and neck. Arch Otolaryngol Head Neck Surg. 1998 Jul. 124(7):790-3. [Medline]. MOORE O, BAKER HW. Carotid-artery ligation in surgery of the head and neck. Cancer. 1955 Jul-Aug. 8(4):712-26. [Medline]. Kennedy JT, Krause CJ, Loevy S. The importance of tumor attachment to the carotid artery. Arch Otolaryngol. 1977 Feb. 103(2):70-3. [Medline]. Goffinet DR, Paryani SB, Fee WE, Chretien PBao. Head and Neck Cancer. Philadelphia: Mosby; 1985.